When it comes to active air sampling, you have a choice between a few common designs. Slit-to-Agar, Centrifugal, Liquid Impinger, and straight filter air samplers all have their uses and individual strengths. However, Sieve Impaction samplers, which also rely on active air sampling methodology, are very popular due in large part to some of the clear bonuses they offer over other technologies. Sieve Impaction samplers are impaction devices, which use the acceleration of air though numerous small holes (inlet orifices) in a perforated plate, which in turn impacts suspended particles in the air onto the surface of the Agar. This is an aggressive and effective method of gathering air samples. The RAS air sampler , as operated by the V100 Air Sampler Controller, even has an onboard thermal label/paper printer capable of capturing critical sampler parameters, making your job easier and your sampling more reliable and productive. At the end of the day, the quality of your microbial air sampling devices is just as important as the quality of any other piece of test equipment. A faulty or poorly designed air sampler can dispel particulates into your environment, impact laminar airflow, miss your designated testing parameters, or corrupt your samples. EMTEK’s Sieve Impaction Samplers, the RAS, bring the same quality assurance and accuracy as our R2S Slit-to-Agar sampler, and are designed for use in clean rooms, protecting the existing work environment from additional contamination. 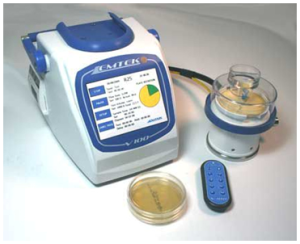 If you have any questions about the benefits of Sieve Impaction technology or which air sampler is best for you individual needs, please give us a call at 877.850.4244 or visit www.emtekair.com for more information. Air sampling is a highly technical process and every lab or environment will have a different approach based on their individual needs.